Who doesn’t love a margarita? National Margarita Day, February 22, is the day to celebrate this refreshing drink of tequila, triple sec, lime juice and simple syrup — and all the delicious variations. The world’s largest margarita, a 10,500-gallon “Calarita,” was made at the California State Fair in 2012. The previous record holder was an 8,500-gallon concoction mixed in 2011 at the Margaritaville Casino in Las Vegas. According to Guinness World Records, it took about 300 hours and 60 people to make the 2011 drink, which contained nearly 2,135 gallons of tequila, 2,282 gallons of one type of margarita mix, 729 gallons of triple sec, and 3,400 gallons of another margarita mix. From a dentist’s perspective, that’s a lot of wear on the teeth! 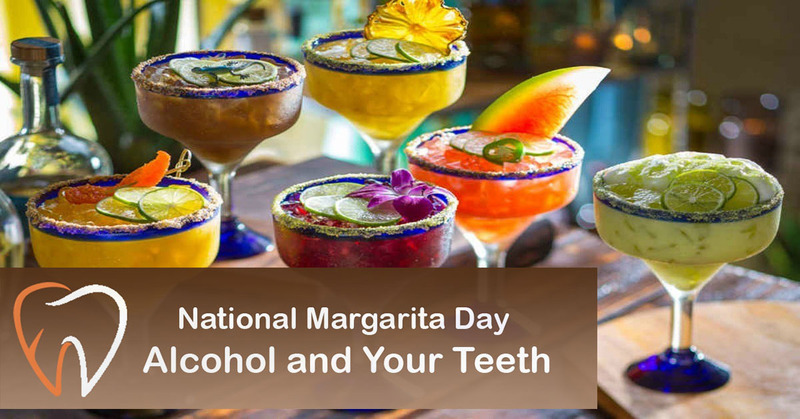 Let’s examine the ingredients in a typical margarita and how they affect your dental health. Alcohol (tequila and triple sec, in this case) decreases the flow of saliva. Plaque and bacteria tend to build up when your mouth is dry, because there is not enough saliva to wash it away. Furthermore, research shows that alcohol consumption can have a negative effect on gum health. Lime juice has a high acid content. Acid erodes tooth enamel, which increases tooth sensitivity and eventually causes damage to the teeth. Simple syrup is made of sugar and water. Sugar, of course, is bad for the teeth. The longer you sip on sugary drinks, the longer the sugar lingers on the teeth, thereby increasing the risk of cavities and tooth decay. Whether it’s a happy hour with co-workers after a long work week, an evening out with friends, or a date night, it’s fun to unwind with some cocktails. National Margarita Day gives us an opportunity to remind patients that consuming alcoholic beverages in moderation, staying hydrated with water to replenish saliva, and diligent brushing and flossing are essential for limiting the impact of such drinks on the teeth and gums.